It's been almost thirty years since Chucky, the Good Guy doll gone bad, first stalked our bedrooms at night. The franchise has been up and down over those three decades, doing whatever was necessary to survive the changing tastes in horror. This means that the relatively-straight slasher horror tone of the first three installments gave way to camp and black comedy with Bride of Chucky and Seed of Chucky around the millennium. The series eventually returned to its roots with the 2013 film Curse of Chucky. Not quite a reboot as much as a palate cleanser and refresh of the ideas that made the Child's Play series so unique and fun in the first place, Curse of Chucky dropped a large amount of the black comedy and chose not to address most of the convoluted continuity in favor of focusing on the lean, original concept and pure scares. 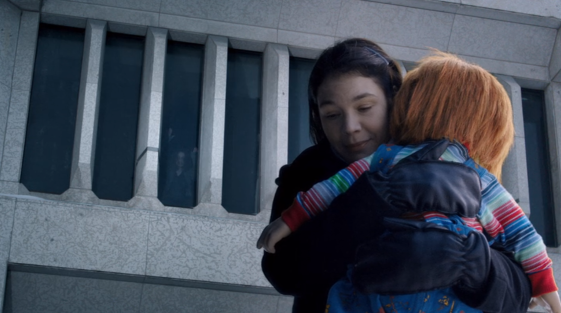 Now, four years later, Cult of Chucky follows up on the events of Curse, but also manages to bring back a ton of the continuity that had been kept on the back burner last time. This movie was written and directed by Don Mancini, the guy who has either written or co-written all seven existing Chucky movies and directed three of them. With Mancini at the helm, this latest, seventh installment in the series manages to work in EVERYTHING from the previous films, and it mostly succeeds at doing so. Unfortunately, this means that if you aren't into certain elements of the long and weird path that these films have taken (I'll admit I'm not wild about Bride and Seed, though I don't hate them), you're bound to be disappointed by some of the developments that resurface here. This movie has so many twists and turns that I have to step carefully, so I'm going to keep this purposefully vague. 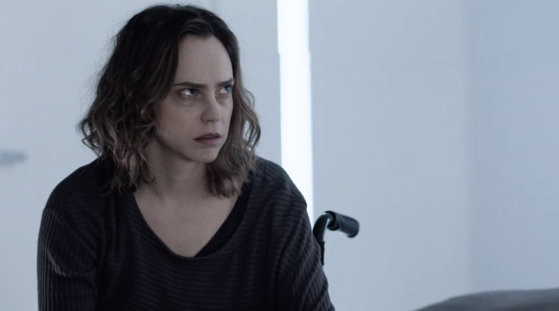 The story centers around Nica Pierce, a wheelchair-bound character introduced in Curse and played by Fiona Dourif, the real-life daughter of Brad Dourif, (aka the voice of Chucky). Nica is in a mental hospital after the torment she endured in the previous film (a la Sarah Connor in Terminator 2), and the doctor/therapist in charge of her rehabilitation seems to have less-than-pure motivations. The hospital is populated by an interesting cast of characters, including nurses, orderlies, and patients, giving this a slight Nightmare on Elm Street 3: Dream Warriors vibe that may or may not have been intentional. Also thrown into the mix are Andy, the kid who Chucky originally terrified in the first two films (played here by the original actor, Alex Vincent), and Jennifer Tilly as Chucky's lady friend, Tiffany Valentine. These are a lot of balls to juggle for a movie that needs to appeal to new viewers as well as old fans, but it mostly manages to pull it off. Let's talk about the cast. Our leads are great. Fiona Dourif is really fantastic as Nica, and gets a lot more room to stretch and chew scenery than she did in Curse. She channels her dad here (in more ways than one), and it's crazy how much she's turning into her father in real life. I don't just mean her physical similarities, which are undeniable, but in her vocal delivery and even in her method of acting. She really is so much like her dad that it's almost creepy. I bet they'd both take that as a huge compliment. Similarly, Brad Dourif shines in the role that he originated all those years ago. What can you say? He's wonderful: scary, creepy, and often very funny as the sadistic killer trapped in the body of a doll. I can't imagine anyone else ever stepping into this role, though I can't help but wonder if this is a possibility, especially as Don Mancini keep stretching where these movies can go and what they can do. Lastly, I have to mention Jennifer Tilly. She doesn't get a ton of screen time, but plays a vital role which she really seems to be relishing. Really, her presence in these movies has always been something of a high point because she always looks like she's having a blast, and it's hard for that not to transfer to the viewer. The supporting cast is more of a mixed bag. The actors who play residents of the hospital are Elisabeth Rosen (House of the Dead), Grace Lynn Kung (The Strain), and Adam Hurtig, an actor who was actually in Curse of Chucky as a different character. These patients all struggle with various psychological issues that become very tedious almost immediately. It doesn't feel right to call out particular performances, but there was more than one that really got on my nerves. Then again, I'm aware that maybe that was the point and that I was supposed to be irritated with some of these people so that I'd be rooting for them to meet their demise. Finally, Michael Therriault (Hemlock Grove) is really good as Doctor Foley, a very intimidating, powerful persona. He holds all the cards, but what control will he have when the chaos begins? Okay, so with all that out of the way, how is the movie? Turns out, it's pretty good! Let's be honest here: no one needed a seventh Child's Play movie, and franchises like this often wear out both themselves and their die-hard fans as what was once fresh and scary eventually fizzles into tired repetition with diminishing returns. If I'm being honest, I think this series ventured off track several installments ago and nearly disappeared from the landscape altogether, but the filmmakers (I guess that would be Mr. Mancini) somehow managed to course correct and rediscover what made this idea special all those years ago. This movie manages to find new things to say and new ways to say them without just copying the beats of the older entries in the series. 2013's Curse offered a fresh take that was grounded in what had already been established. Cult of Chucky moves things forward considerably, even leaving the door wide open for this franchise to go anywhere it wants to. Cult of Chucky ups the ante on everything. There's more violence, more gore (maybe the most graphic imagery seen in this series to date), and more Chucky...LOTS more Chucky. It manages these things while balancing a sense of humor that is not as silly or campy as the Bride and Seed movies, but isn't too far removed from the over-the-top style that has come to be a hallmark of this series. In other words, Chucky has lots of one-liners, but he's not going to be hosting Saturday Night Live anytime soon. The wicked sense of humor is actually appreciated because it keeps this movie from taking itself so seriously that we can't have fun with what we're watching. I should point out that this movie is also very self-aware of the world in which it takes place and uses that, for the most part, to ground it in 2017 in the same way that the first movie was grounded in 1988. I think most of this movie really works, but there are a few things holding it back. As much as I admire the respect paid to the continuity of the series, I actually think that it's become a hindrance. I find it admirable that everything that came before is still tied to the story, but there are certain things I wish weren't. Also, this movie does feel incredibly low-budget, and not in a charming way. It feels a lot like a production that was shot for television; there are really only two locations in the entire movie, and we're only in one of them for a few minutes, meaning that most of the story unfolds in the hospital, which feels sterile and visually dull. For contrast, look at a movie like Halloween II, which also largely unfolds in a hospital, but never feels cheap or restrictive because we're always seeing new parts of the building and sometimes get to go outside. However, I understand that low costs are crucial to making sequels like this one a reality, and that doing things independently and on a budget dictated that the filmmakers had to make the most of what they had. I admit that the sense of claustrophobia from shooting almost the entire movie inside a single location does add to the atmosphere and tension. I will also note that the Chucky special effects always look really great, and the animatronics are incredible. I imagine a lot of the budget went into the robotics, and you can tell. As always, Child's Play movies are about so much more than killer dolls. If you want to watch them that way, you're bound to enjoy the ride. However, I've always been interested in what's going on beneath the layers of these movies. For instance, I think the original movies had themes that dealt with the violation of childhood, the loss of innocence, and the threat that can come at children from a very safe and trusted place. Furthermore, the eighties were rife with commercialism (which the movies may have been commenting on), and there was a backlash at the time about how marketing to children was actually dangerous to their well-being and purity. Some of those themes are carried over here, but we seem to be dealing with different threats because we live in a different era. 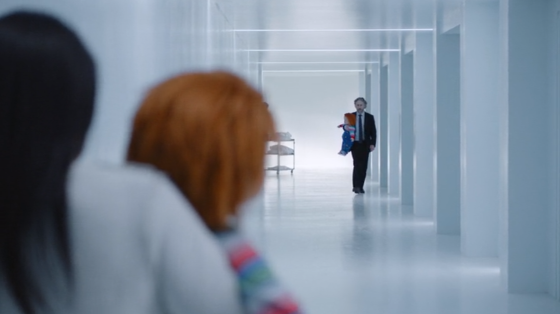 The big takeaway I got from this movie is that Cult of Chucky has a lot to say about faith in leaders, paranoia, and our inability to let go of the past. 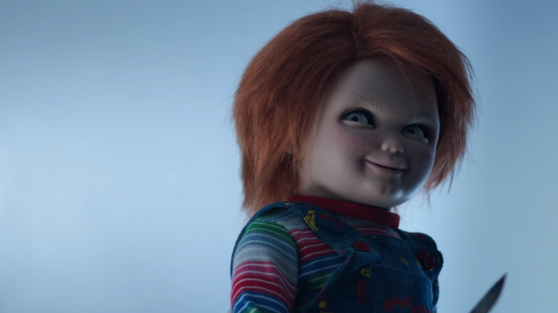 If you look beneath the surface of just about every single horror movie, you'll find something relevant looking back at you, even if the writer wasn't conscious of the message, and Cult of Chucky is no different. Ultimately, Cult of Chucky is a fun, occasionally effective sequel that is a lot better than it had any right to be. While I think the movie is hampered by some of its performances and some of the decisions with the continuity, this is certainly a thrilling ride. If I had to give it a grade, I think I'm in the 3/5 range, but I really do give it props. In the age of Netflix and streaming services, we're flooded with dozens of direct-to-streaming horror movies every single year, and it can become numbing to wade through them, especially when so few of them have anything interesting or new to say. 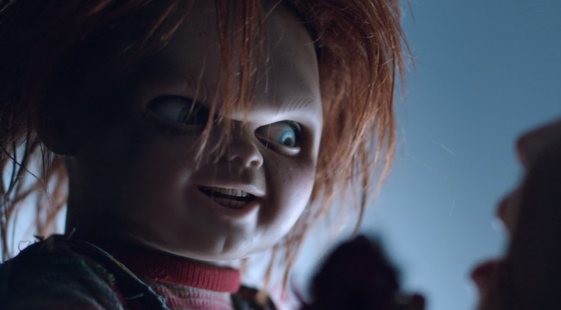 On that note, it feels good to have a new movie with a classic horror icon like Chucky out for this Halloween season. I don't think it's the best entry in the series, but it tries some new things and takes chances, which is commendable. Cult of Chucky offers just the right amount of nostalgia, but doesn't play like a greatest hits, even when I sometimes wish it did. Other horror franchises should take note. It's great to see Chucky again, and I'm willing to bet that we haven't seen the last of him. 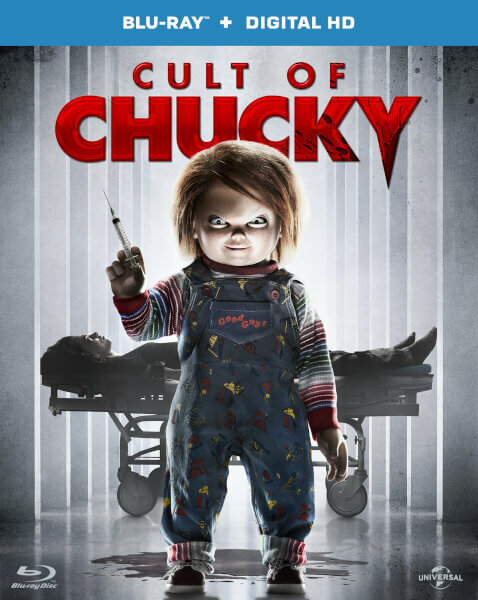 Cult of Chucky is available on Blu-ray/DVD, VOD, and Netflix.